In a Mexican cave system so beautiful and hot that it is called both Fairyland and hell, scientists have discovered life. It is trapped in crystals. The evidence of life could be 50,000 years old. 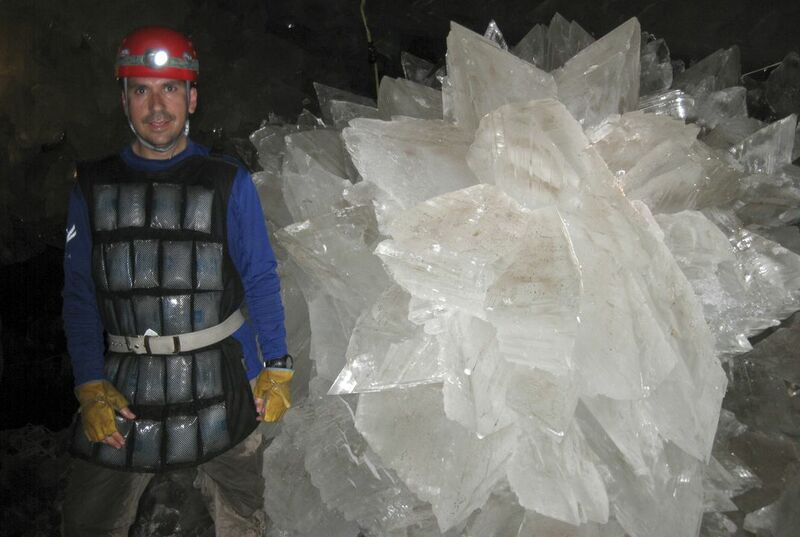 The bizarre and ancient microbes were found dormant in caves in Naica, Mexico. They were able to exist by living on minerals such as iron and manganese, said Penelope Boston. She is the head of NASA's Astrobiology Institute. "It's super life," said Boston. She presented the discovery at the American Association for the Advancement of Science conference. It was held in Boston. Though it was presented at a science conference and was the result of nine years of work, the findings haven't yet been published in a scientific journal and haven't been peer reviewed. Boston planned more genetic tests for the microbes that she revived both in the lab and on site. The life forms - 40 different strains of microbes and even some viruses - are so weird that their nearest relatives are still 10 percent different genetically. That makes their closest relative still pretty far away, about as far away as humans are from mushrooms, Boston said. The Naica caves are in an abandoned lead and zinc mine. They are half a mile deep. Before drilling occurred by a mine company, the mines had been completely cut off from the outside world. Some were as vast as cathedrals. Crystals lined the iron walls. They were also so hot that scientists had to don cheap versions of space suits - to prevent contamination with outside life - and had ice packs all over their bodies. Boston said the team could only work about 20 minutes at a time. Then the team members would have to duck to a "cool" room. That room was about 100 degrees. NASA wouldn't allow Boston to share her work for outside review before the Feb. 24 announcement. So scientists couldn't say much. But University of South Florida biologist Norine Noonan said it made sense. Noonan wasn't part of the study but was on a panel where Boston presented her work. This isn't the oldest extreme life. Several years ago, a different group of scientists published studies about microbes that may be half a million years old. They were still alive. Those were trapped in ice and salt, which isn't quite the same as rock or crystal, Boston said. The age of the Naica microbes was determined by outside experts. They looked at where the microbes were located in the crystals and how fast those crystals grow. It's not the only weird life Boston is examining. She is also studying microbes commonly found in caves in the United States, Ukraine and elsewhere. These microbes eat copper sulfate and seem to be close to indestructible. Life on Earth "extremely tough and extremely versatile" because a living thing called microbes they lived up to a million years old and still alive trapped in ice and salt.According to the article,Scientists find ancient life trapped in weird cave,it states,Several years ago, a different group of scientists published studies about microbes that may be half a million years old. They were still alive. Those were trapped in ice and salt, which isn't quite the same as rock or crystal, Boston said.That's why Earth is "extremely tough and extremely versatile." Earth is "extremely tough and extremely versatile" because This isn't the oldest,oldest extreme life. Several years ago, a different type of group of scientists published studies about microbes that may be half a million years old.According to the passage "Scientist find ancient life trapped in weird cave" it says that the microbes are very old. Life on Earth is "extremely tough and extremely versatile" because it is very hot inside the cave. According to the text in the last paragraph, it says "The age of Nacia microbes was determined by the outside experts. ".This sentence means is that the outside experts know a lot about the cave and they know that is hot inside the cave. This sentence also means that the cave is to to to old and that is why it got to hot inside and plus it is summer where the cave is. People wear gears inside the cave to keep them safe inside the cave and they also wear helmets that construction people wear when they are building. Life on Earth is "extremely tough and extremely versatile because it is very hot inside the cave. Life on Earth is "'extremely tough and extremely versatile'' because,In the text it said,''This isn't the oldest extreme life.Several years ago,a different group of scientist published studies about microbes that may be half a million years ago. ''I think this means that they have been having the oldest extreme.That is why Life on Earth is ''extremely tough and extremely versatile. Life on Earth is extremely tough and extremely versatile because this isn't the old extreme life. Based on the information given in the article I have come to my conclusions and was sure this is the answer. According to paragraph 11, "This isn't the oldest extreme life. Several years ago, a different group of scientists published studies about microbes that may be half a million years old. They were still alive. Those were trapped in ice and salt, which isn't quite the same as rock or crystal, Boston said." I had to come with this answer. Life on earth is extremely tough and extremely versatile because several years ago,a different group of scientists published studies about microbes that may be half a million years old.They were still alive.They were trapped in ice and salt,which isn't the same as rock or crystal, Boston said.According to the article "Scientists find ancient life trapped in weird cave" it says this isn't the oldest extreme life. Earth is extremely tough and extremely versatile because long time ago there are little microbes stuck in salt or ice. In the article "Scientists find ancient life trapped in weird cave " it said that this isn't the oldest extreme life. Several years ago, a different group of scientists published studies about microbes that may be half a million years old. They were still alive. Those were trapped in ice and salt, which isn't quite the same as rock or crystal, Boston said. That is why earth is extremely tough and extremely versatile. Life on Earth is extremely tough and extremely versatile is because there are alot of things that you can discover and do thing that are changelling.According to the article "Scientists find ancient life trapped in weird cave",stated that "Why are we surprised? ",Noonan said. "As a biologist I would say life on Earth is extremely tough and extremely versatile. 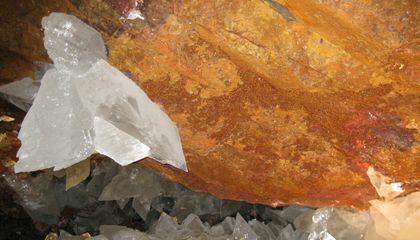 "This isn't the oldest extreme life.Several years ago,a different group of scientists published studies about microbes that may be half a million years old.They were still alive.Those were trapped in ice and salt,which isn't quite the same as rock or crystal,Boston said. Life on Earth “extremely tough and extremely versatile because there are a lot of hard things in life like...having a job and taking care of your self.According to the artical"If confirmed, the find is yet another example of how microbes can survive in extremely punishing conditions on Earth.So now you now Why is life on Earth “extremely tough and extremely versatile.